Amethyst is a meditative and calming stone which works in the emotional, spiritual, and physical planes to promote calm, balance, and peace. It is also used to eliminate impatience. Amethyst is also excellent for meditation and lucid dreaming. It is used to open one’s channels to telepathy, past life regression, clairaudience, clairvoyance, and communication with angels. Amethyst also protects against psychic attacks, especially during spiritual work. Amethyst is very well known — as from the ancients — as a sobriety stone. It has been used for millenia to prevent drunkenness, and is used to assist in getting rid of addictions to alcohol, drugs, smoking, etc, and destructive compulsive behaviors of all kinds. Physically amethyst is said by spiritual healers and mystical lore to heal the withdrawal symptoms of any sort of addiction, help with headaches, insomnia, arthritis, diabetes, pain relief, circulatory system issues, endocrine system problems, chronic fatigue, fibromyalgia, immune system deficiencies, asthma, phobias, pregnancy and preventing miscarriage, menopause, PMS, and general healing. Amethyst is associated with the third eye and crown chakras primarily, but can also open the heart chakra. It is also associated with both air and water elements. 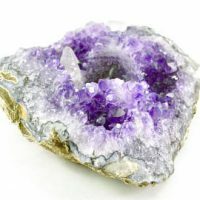 As a variety of quartz, amethyst has the energies inherent in quartz, as well as its own unique vibration.